These four photographs show the hospital building, later called the Tower Building when it was purchased by the Menninger Foundation. It was constructed in stages with funds from the Security Benefit Association members, an early social security program. Details of all of the construction are in "A Nickel a Month" by Dean L. Smith. The Security Benefit Association served as a type of insurance for its members. 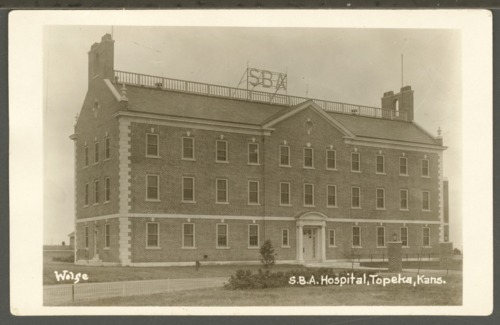 Security Benefit Association hospital in Topeka, Kansas - This is a view of the hospital before the tower and the wings were added in 1929. It stands high on a hill overlooking Topeka, Kansas.